Long-time vehicle operation in difficult conditions, engine overheating, increased pressure in the lubrication system, application of low-quality motor oils results in wear and aging (loss of elasticity) of rubber seals. As a result, oil stains appear on the engine. Oil runs not only contaminate the outer surface of the engine but also cause penetration of abrasive substances (dust, sand etc.) into the engine, which accelerates the engine wear in general. Moreover, decrease of the cross-section of channel passages and regulating valves (tar deposits, slagging) of the crankcase ventilation system leads to the increase of crankcase blow-by gas pressure as well as to oil throwing through the orifice of the oil level gauge, valve cover gasket, petrol pump, trembler etc. Accumulation of blow-by gas in the crankcase deteriorates properties and composition of the motor oil. If the engine uses a fuel carburetor system, malfunctions of the crankcase ventilation system have no significant impact on the operation of fuel and ignition systems. In case of modern engines with fuel injection systems, malfunction of the crankcase ventilation system can lead to a complete failure of the engine control system. 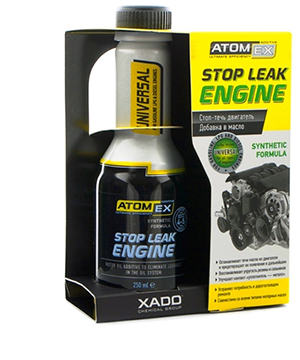 In order to restore the elasticity of operating surfaces of rubber seals and eliminate oil leakages, use Atomex Stop leak engine. 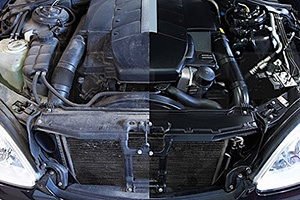 In order to maintain normal operation of the crankcase ventilation system, clean the engine oil system with Vita Flush – oil system cleaner, or TotalFlush – oil additive for cleaning of engine oil system with piston ring anticarbon effect, or Verylube oil system cleaner (quick or soft), before the oil change. In order to eliminate oil stains on the outer surface of the engine, use VERYLUBE Engine compartment cleaner before cleaning.